Welcome to my first battle report! The Tyranids got the southwest corner and the west long board edge, and the marines got the northeast corner and eastern long edge. The goal was to capture three objectives, crystals that were each placed in the ground floor of ruined buildings. 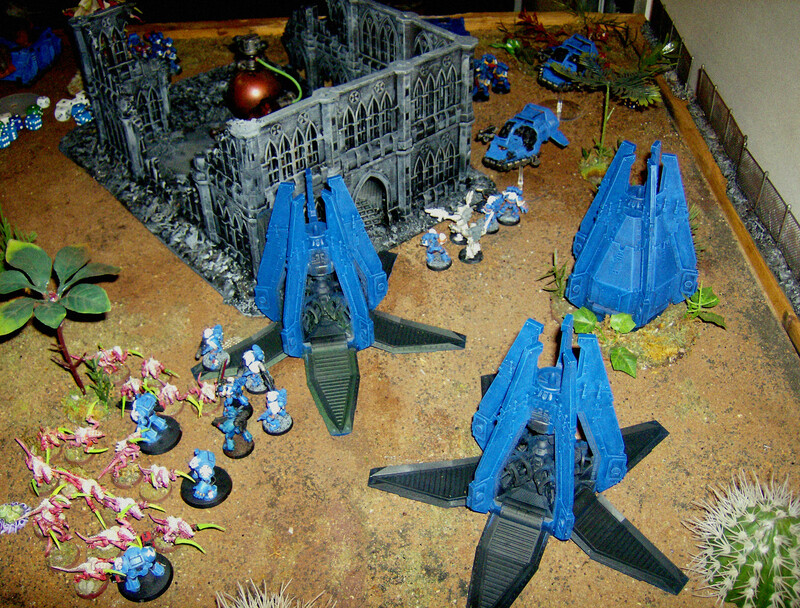 The cautious Ultramarines chose to take second turn and leave everything in reserve. This let the bugs roam the field and take the center position, grabbing the south and center objectives. 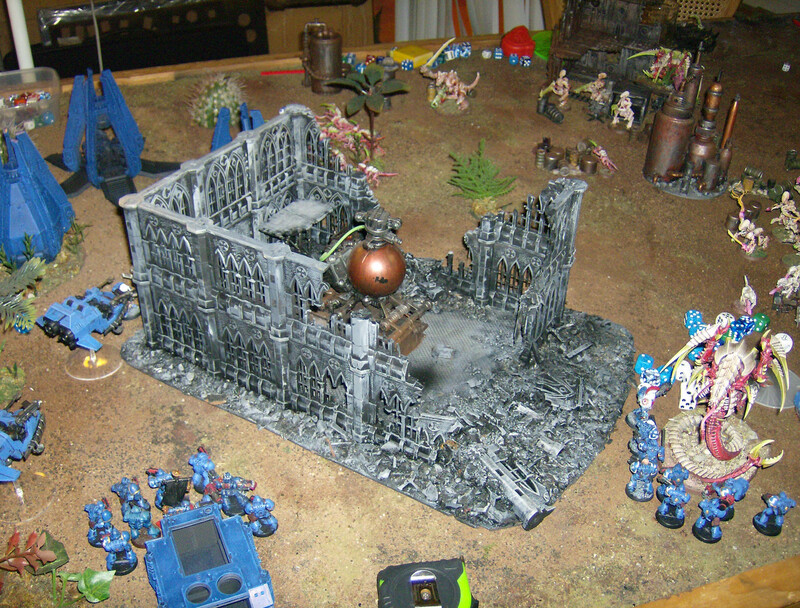 The Tervigon set up shop directly on the south objective, squatting down to release a flood of bile and termagaunts onto the ruins. 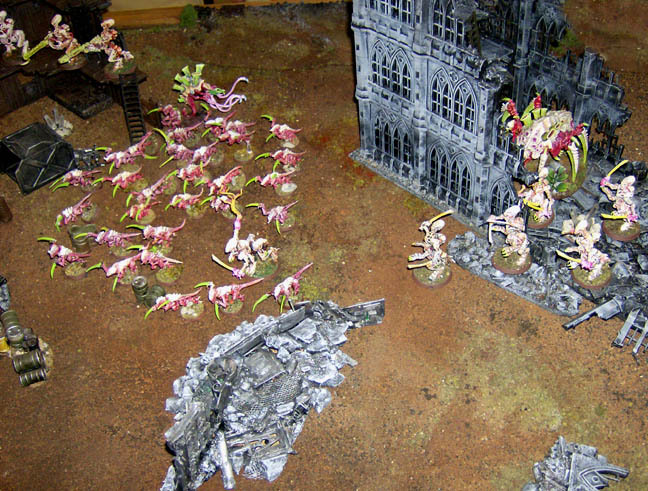 It was guarded by the Tyranid warriors. 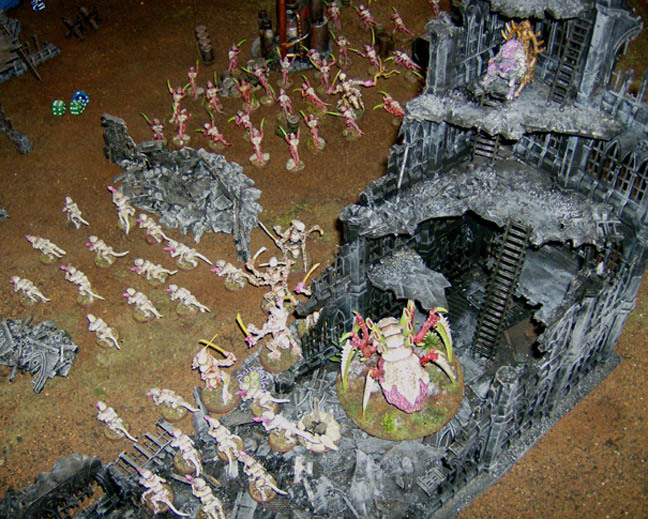 The large Hormagaunt swarm, the Venomthrope, and the Tyranid Prime charged forth. 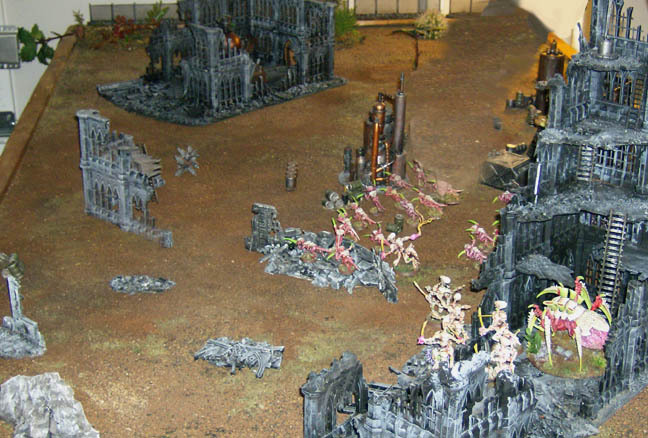 The Hive Guard took the ruins above the center objective, they are just out of frame in the picture below. This left the Mawloc, Termagaunts, and Tyrannofex in reserve, plus the two 15 strong Genestealer units outflanking. On Marines Turn 1, two drop pods thundered down from the sky to land near the north objective, the crystal processing plant. They deployed, detecting blips all around them and closing fast on their position. Turn 2 opened with the Broodlord and 15 Genestealers outflanking right next to the marines, charging immediately and inflicting serious casualties. 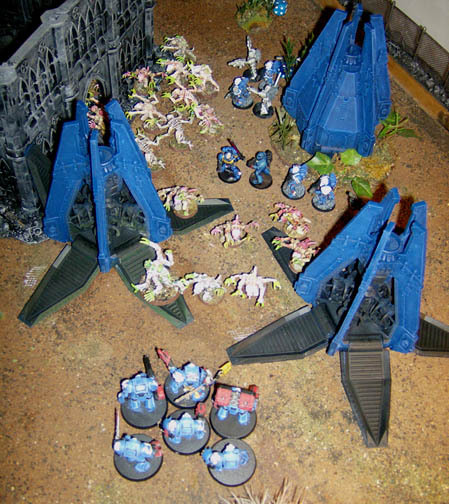 Four Marines were slain but the survivor stubbornly stood his ground, locking the Genestealers in combat and keeping them safe from shooting. 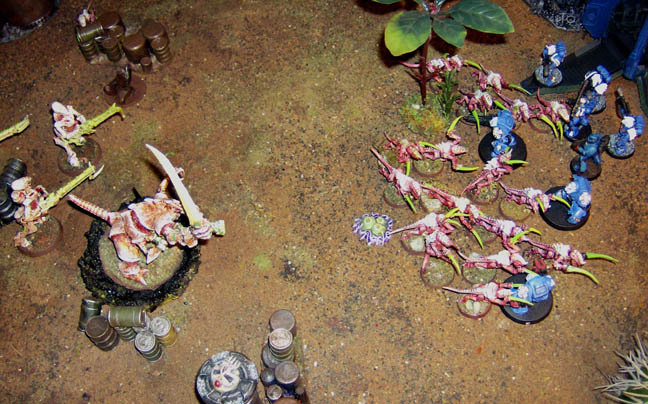 The 15 Termagaunts scuttled in from the southeast corner and charged the other drop podded combat squad. They forgot to shoot, inflicted no unsaved wounds, lost the assault, and since they were out of synapse they promptly ran away. They were a slight distraction, nothing more. It could have worked. The Tervigon cranked out more babies, everything advanced, and the Hive guard shot a marine. 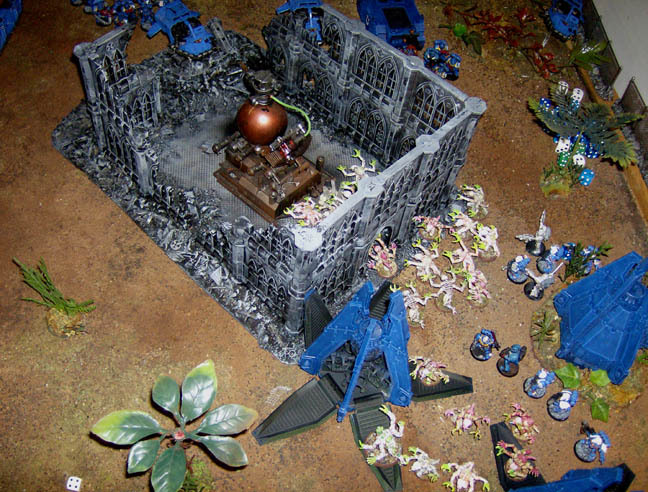 The marines responded with another drop pod, but had no viable targets to shoot. They set up in the building next to the north objective. From the eastern long edge a tac squad rhino zoomed in, supported by landspeeders. They shot up the Venomthrope but not much else. Turn 3 saw the second unit of stealers come in outflanking in the same section, and the poor marines were completely overrun. The Mawloc tried to emerge under the cluster of speeders and the rhino, deviating a bit but wrecking the rhino. The Tryannofex wandered onto the board and shot the assault cannon off of a speeder. 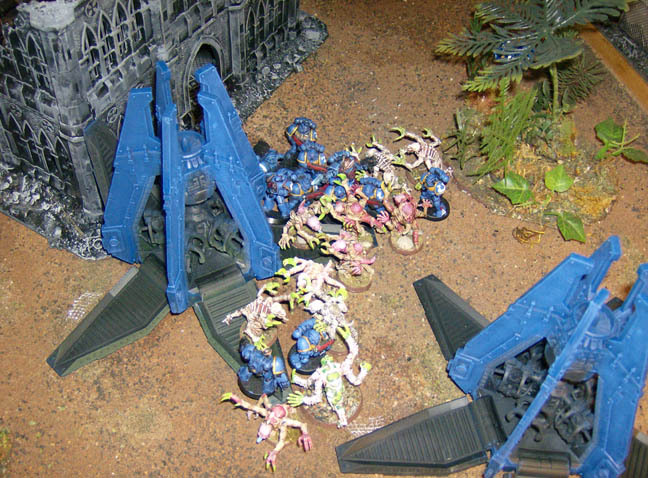 More marines were lost to genestealers ripping them apart. 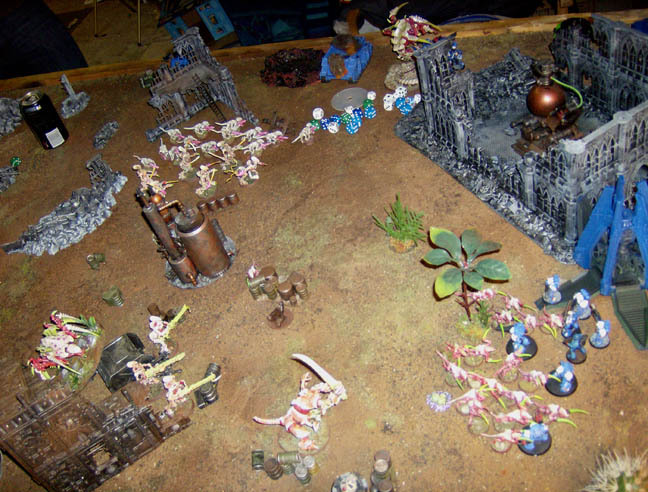 The Termagaunts, Hormagaunts, and Warriors continued to flood the board with bodies, advancing on Marine positions. The Tervigon made more babies but I think we were running out of gaunt models, and they weren’t even necessary at that point. 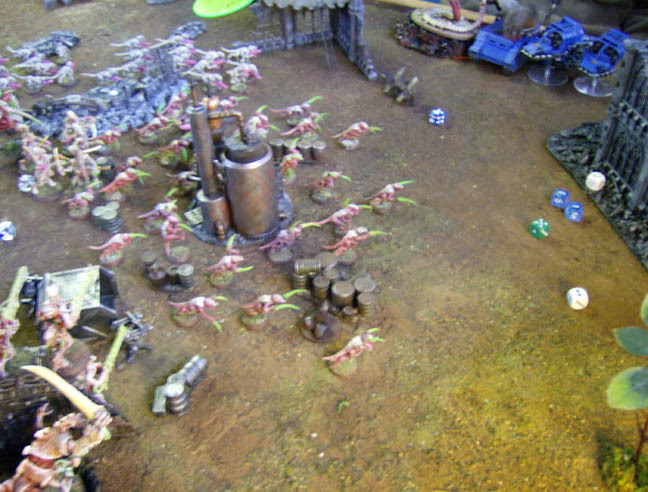 The Marines responded with ineffectual shooting at the Mawloc, their bolter shells bouncing off the creature’s thick carapace. The one wound inflicted was quickly regenerated. Finally the Sternguard, Librarian, the Captain, the shooty Terminators, and the last rhino tactical showed up. 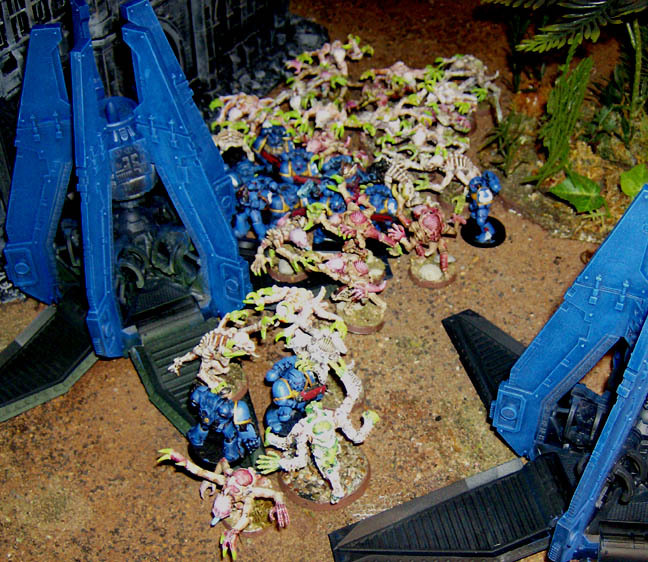 The Marines configured their autosenses, took aim, and chewed up the genestealers with concentrated fire. The landspeeders zoomed around and helped finish off the two units. It was looking pretty bad for the marines. We decided to call it at the end of turn 4 as the Marines simply did not have enough resources or mobility to contest or claim more than one objective. In my opinion this was due largely to the unoptimized Marine list, combined with dribbling in a little at a time. It also helped that the Tyranids were played by a hive mind (two players against one). 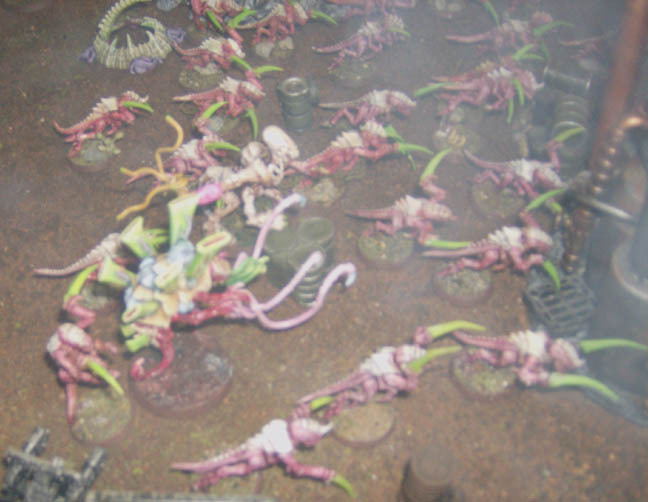 The pincer move of the genestealers was too devastating to recover from, since it wiped out several of the marine scoring units, with the Mawloc locking up another. The Tervigon pumping out so many gaunts was tough to deal with, especially with insufficient flame and template weapons there was simply too much of a horde to counter, and all three monstrous creatures were running around unharmed or regenerating a wound or two. It was a fun game! All of us were a bit rusty from not playing in a long time but we still gave it our best. At the end of turn four it was 2 objectives to 0, short of the Emperor’s interference the Marines could at best make it 2 to 1 if we played more turns. 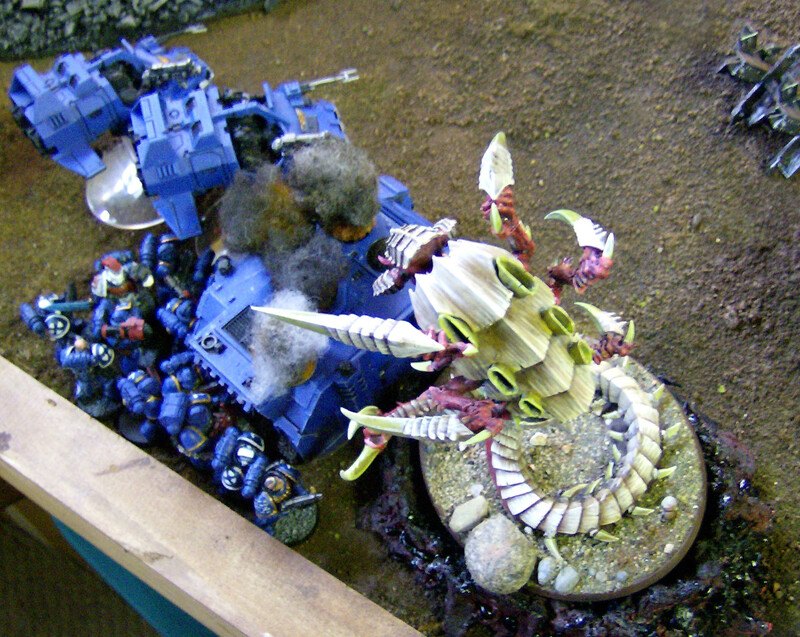 This entry was posted in Battle Reports, Space Marines, Tyranids, Warhammer 40K. Bookmark the permalink. Wow, that looks like serious fun! Your terrain is really nice, man! We need to set up another game date at your place! Thanks! Yeah, I would like a rematch of some sort, I might be fielding the Boyz this time around. Much of it would be no problem. I can do the prime, hive guard, 1 venomthrope and 1 proxy, tervigon, hormagaunts, termagaunts, 1 trygon. I’ll prime and base coat my new tyrannofex and that could be the second trygon, ditto for the spore. We would have to do normal warriors for shrikes. The gargoyles are the real problem, I only have 10 unpainted. 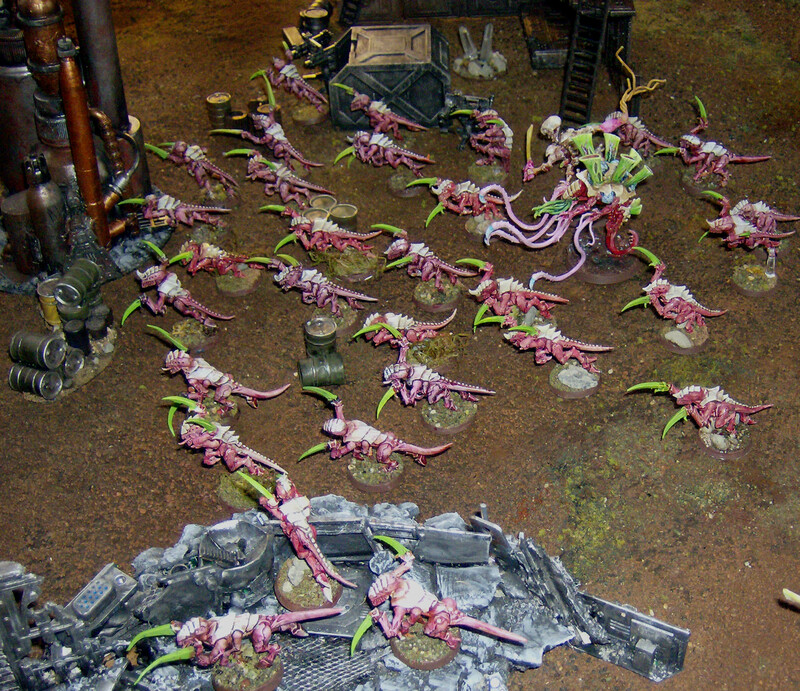 We could use genestealers I guess. No sweat! Just a thought. I’ve been digging ‘Nids recently (that and White Scars!). Now that my Eldar is basically done (collecting, not painting! ); time to start thinking of the next army. 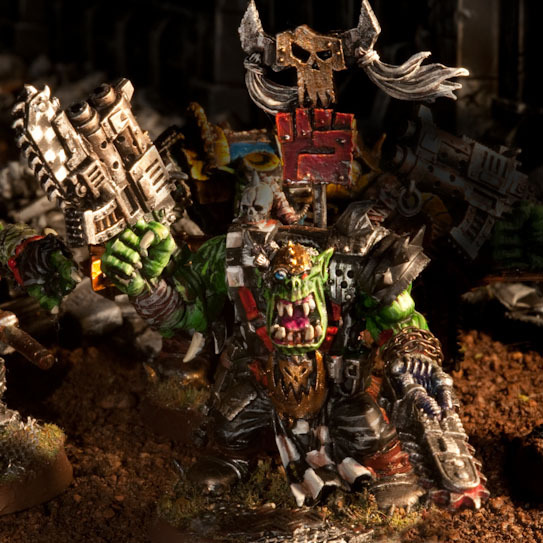 Well do you want to proxy the gargoyles (Stormboy mid-slaves), tweak the list (Tyrannofex? ), or switch armies? Hmmm, I’d have to shave 65 points to go from Trygon to Tyrranofex. I have no issue proxying; but your stuff is so pretty!